Perth Maraget River Caves Guide - Which caves to choose? There are over 100 caves in Margaret River Region . Which ones should you choose? Even though there are 100 of caves, only a fistful is open to public. The well known caves that are often featured are Ngilgi Caves, Jewel Caves , Mammoth Caves and Lake Caves. These caves are managed by private firms and more popularly known as Show Caves. Off the beaten track are Calgardup Caves and Giant Caves. These 2 are managed by Parks and Wildlife Services (Govt of Western Australia). They are less 'developed' but promises an authentic experience. Looking for Adventure? Ask your guide! Here is a guide of caves and what to expect. Ngilgi Caves was discovered in 1899 and is the first caves that is open to public. The main tour is semi-guided where you are free to explore on your own for certain periods. For the more adventurous, there are adventure tours available ( not suitable for young) where you need to climb to explore. This is the nearest cave to Dunsborough and the first cave you will pass through if you are travelling from Perth. Suitable for younger kids. There are mini caves for kids to explore. In addition, spot the beautiful formation created by nature in the cave. If you like to sing, there is a chamber that amplifies your voices. Singing there would be a surreal experience. Location :Jewel Caves Rd, Deepdene WA 6290. Billed as the largest show caves with 3 massive chambers , this cave is home to one of the largest straw stalactites found in Australia. This is a fully guided tour. 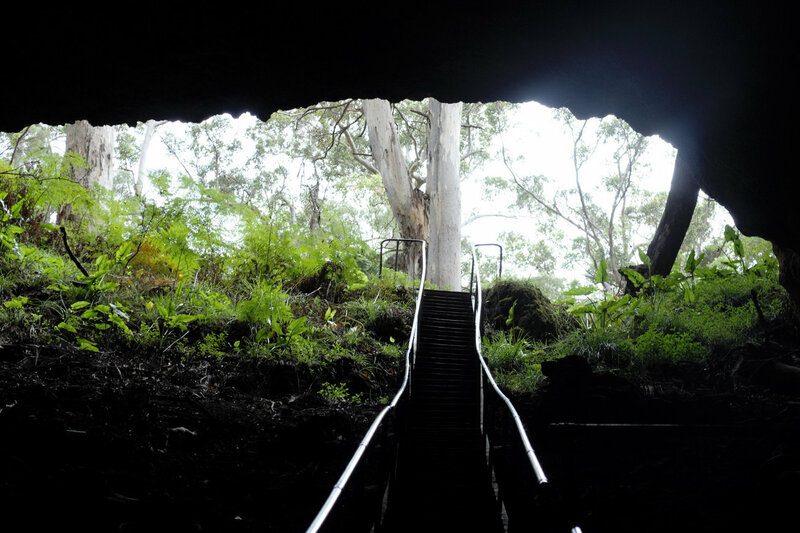 The tour guide will give you a brief history of the caves with stories such as Tasmanian Tigers that fall into the caves and vanish. Jewel caves is well lighted. There is even a mini lightshow during the tour to bring out the sparkle in the caves. We recommend to combine this visit with a morning whale watch and nearby Cape Leeuwin Lighthouse tour. Mammoth caves is one of the larger show caves in Margaret River. Unlike Ngilgi Caves and Jewel Caves, there are no guides to bring you around. You will be provided with audio self guided system to explore at your own pace. If you are looking for serenity, visit the caves during off peak hours to enjoy the tranquility of the caves. Unlike the earlier two caves, there are no fancy lights in the caves. It is bask in white light that showcase the natural stage of the caves. The first chamber of the caves is accessible by wheel chair too. Look closely and you may spot a fossil or two on the walls of the caves. Be awe by natural structures such as the inverted 'ice cream cone' and the lighted golden rock found within the caves. If you are a hiker, you might like to take the slightly longer bush walk back from the exit of the caves to the carpark. For city folks, this is a pretty safe way to get acquainted with nature. Mammoth caves is one of the 4 public caves found on Caves Road towards the impressive Boranup Forest. The other three are Calgardup Caves , Giant Caves and Lake Caves. If time permits , you can combine all three caves in one day! 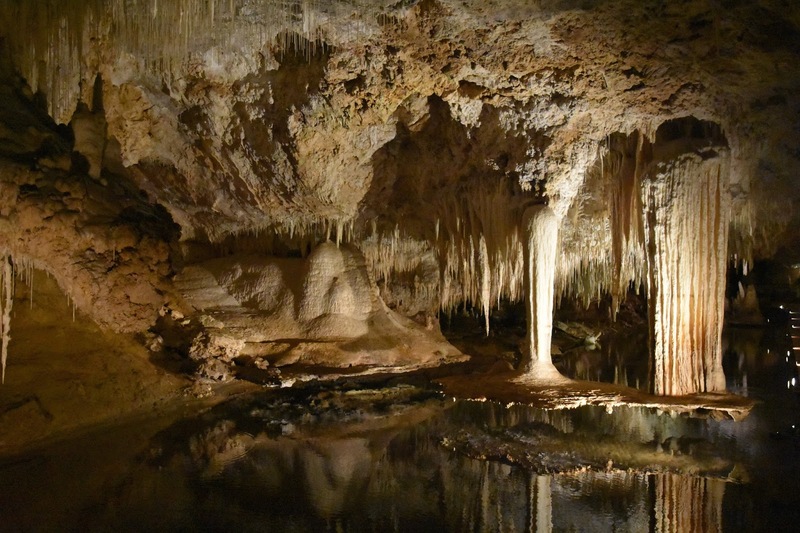 Lake Caves is famous for being the only cave in Leeuwin-Naturaliste Ridge that has its own permanent lake. The main attraction will be the 'suspended table' ( seen above) that seems to float above the water. A magnificent natural sight to behold. Lake Caves, Mammoth Caves, Jewel Caves and Ngilgi Caves are managed by the same management. If you are visiting more than one caves, we recommend you to consider the 2 to 4 cave passes for better savings. Suitable for adventurous kids. Not recommended for toddlers. Calgardup caves is one of the two caves that are manged by the DEC ( Department of Environment and Conservation. It is a self guided tour . This is the cave where you explore by torchlight in total darkness. The cave is only 27m deep with 2 branches each about 150m long . It may be the smallest cave we visit but it is one of the more thrilling one we have been to. In spite of the distance, walking in total darkness for 150m each way actually feels like an eternity! There are passages that are only 1.4 metres tall and adults will need to watch their heads when they walk. Helmets are provided for this trip. The coolest part of the tour is that when you reach the end of the branch, you could choose to switch off all lights and enjoy the silence. It was total darkness when we did that and we only had the sound of dripping water to accompany us. You would not even see your hand if it is just in front of you! That said, toddlers might not appreciate the darkness and may not be suitable for this tour. Complete the experience with a walk at the bush for about 800 meters. Calgardup may not be as fancy as the privately owned show caves, but if you are looking to explore caves the old fashion way, this will be it! For kids age 6 and above. For the more adventurous, Giant Caves would present the ultimate adventure cave experience in Margaret River. Here , you will have to negotiate vertical ladder climbs and rock scrambles, tight spots and gigantic chambers, natural cave floor and constructed walkways for more than half a kilometre in the 86m deep Giants Cave. The experience is only open for kids 6 and above. Do wear proper shoes ( no slippers / sandals) as you need to manoeuvre over rock formations to explore the cave. 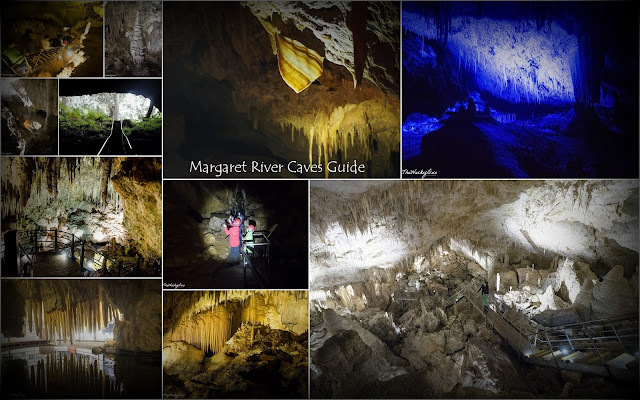 For more Margaret River Adventures, check out the following posts.